Put in I in those letters and you discover what too many people have done: homogenized and pasteurized the remembrance of a man who pushed America to do right for all its people. 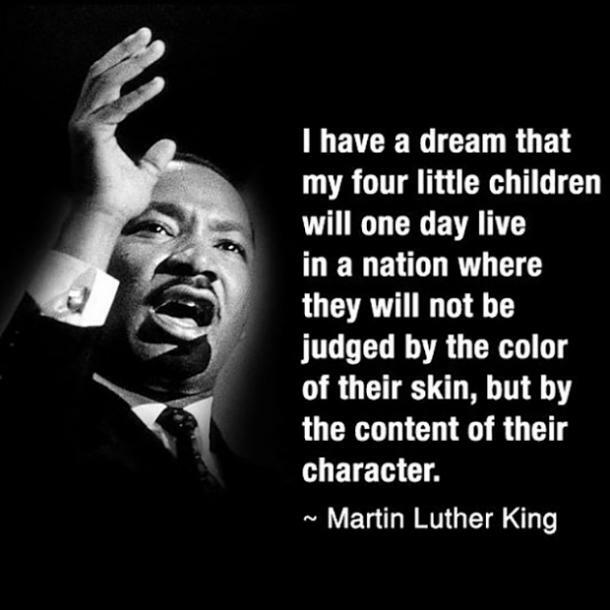 This is the quote often used, but used too often by people who are doing exactly that: judging character by the color of skin. That they may be unaware of it is not an excuse. Anyone who believes Dr. King would approve of the retreat into racism, segregation (if you don’t believe that, you haven’t been paying attention to charter schools and ‘choice’), and violence against black persons by institutional forces is foolish. Anyone who believes that Dr. King would excuse unjustified killings by police of innocent, no even guilty, black people because of the violence tearing apart urban neighborhoods is intellectually lazy and foolish. Anyone who believes that Dr. King would smile upon talk radio trashing workers and unions has forgotten why he was where he was when his life was taken. They are foolish. His greatest wonderment was why poor whites persisted in prejudice and hate. Why can’t they realize that the movement for social and economic justice would benefit them, too? They should be the greatest allies. To this day, they are not. If he was alive today, he would have harsh words for us but spoken in love. Don’t be silent. Raise your voice. That fierce urgency has not diminished. This is our time and we need to be getting on with it: justice and fairness and an eradication of systemic racism from our lives.